After getting flayed by Barcelona last night (5-1), Valencia have yet more ignominy to deal with this morning by having to announce to the waking world that defensive midfielder Ever Banega is now set to miss the next six months after fracturing his leg/ankle in a bizarre incident at a petrol station. Basically, he Brian Harvey-ed himself. Valencia also confirmed that the break was not clean, that the area was inflamed and that Banega is now scheduled to undergo surgery this morning with the ‘period of recovery estimated to be around six months’. 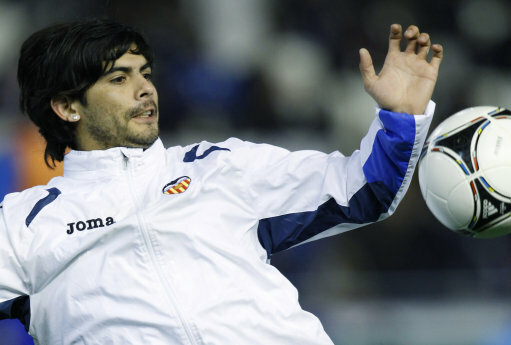 Apparently Banega (who was already sidelined with a knee problem) pulled into the forecourt after an individual training session, forgot to put his handbrake on, clambered out of his Nissan Micra and the whole thing just rolled back on him, trapping his foot underneath the wheel – which is, of course, the handiwork of a complete and utter turnip. Sad news. And a tad funny. But mostly sad. Excellent player. Valencia will miss him. serves him right for taking his wifes car out.